Q. I have a 6 month old cat who we want to let into the garden soon, she has been spayed and has had all her vaccinations. We aren’t sure how best to go about this, or if it is a bad time of year? Can you give me some advice please? Thank you! Certainly! The first thing I would advise is not to let her out at night time until she is used to going out during the day time. At this time of year, one loud bang from a firework could startle her and she may panic and flee (not necessarily back into the house!). So, if you want to let her out, do so gradually so that she can become accustomed to the garden during a quiet time of the day. 1. Ensure she is identifiable just in case she does decide to wander – have her microchipped and fit her with a suitable collar with identification. 2. Confirm there are no potential hazards in the garden – chemicals (pesticides, rodenticides etc. ), sharp objects, ponds…remember cats are curious creatures and they will find mischief if it is to be found! 3. Ensure she is hungry! This gives you some bargaining power when it’s time for her to come back in. Shake the food packet or rattle her dinner bowl and she should come running back. I would encourage you to supervise her for her first few trips outside. As she gets more confident, allow her longer periods but start off with 10-15 minutes at a time. Hope this helps! For further advice on helping your new kitten settle into your home, click here. Q. My dog loves swimming in the sea, is it dangerous to let him swim on a really cold day? When I get him home I always dry him off really well, but how long does it take for the effects of the cold to harm his health? A combination of cold winds, low air temperatures and low water temperatures can put your dog at risk of hypothermia. Dogs won’t always be able to tell that it is the water making them feel cold. Different dogs will be able to cope with different temperatures. Small, skinny, old or young dogs may be at a greater risk of developing hypothermia. A dog showing signs of hypothermia will be pale and shivering, which can progress to lethargy and weakness if severe. If you notice any of these symptoms please bring your dog into The Vet immediately – you don’t need an appointment. If you do take your dog swimming be sure to dry them off quickly and get them into a warm and dry place, such as the car, as soon as possible. Use towels and a hairdryer to ensure thorough drying. Q. I’m worried about my rabbits and chickens being cold in the winter in their hutches. Do you have any tips about how I can keep them warm? Make sure to check your rabbits throughout the day, ideally at least three times a day, making sure their beds are dry and they have plenty of food and water. Companionship is important for rabbits, even more so in the winter months as they can snuggle up to each to keep warm. Straw provides a warmer bed than hay as long as it is in a thick layer and remains dry. Additionally you can use tarpaulin sheets or duvets over the top of the hutch to keep it insulated. If you have a shed their hutch can be moved inside providing plenty of shelter from the cold weather. It’s important that your rabbits are still able to get out of their hutches to exercise in the colder months. Take a look at our blog to find out more about keeping your rabbit healthy this winter. For chickens a thick layer of bedding in the shed is ideal for keeping them warm. Be sure not to block off any ventilation or pack chickens in too tightly together as this can lead to respiratory infections developing in the flock. Damp housing can also cause problems so it’s important that the sheds are well ventilated even in colder months. For both chickens and rabbits ensuring a constant water supply is important – water can freeze over winter so keep an eye on your water sources. Q. If my cat has had his flu jab, can he still get a cold? 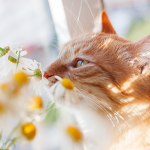 A ‘cold’ in cats as in humans can be caused by a number of different viruses and bacteria. The most common in cats is Feline Herpes virus (FHV-1). If your cat has been exposed to this virus at any point, he will become a carrier of the virus. This does not mean that he will be ill but the virus will persist and symptoms may recur any time he becomes ‘run-down’ or stressed. (The virus is a cousin of the human virus that causes cold-sores; we become carriers of the virus but only develop cold-sores when we are run-down). The vaccination cannot prevent infection with Herpes virus but can drastically reduce the severity of symptoms and speed up the recovery time from infection so it is important to keep them up to date. They are also important as they cover against more than just cat flu. 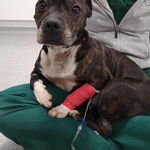 If the ‘cold’ symptoms persist longer than a few days or if he seems unwell, please come into the clinic and have a vet check him over, it’s likely a course of antibiotics may be required as a secondary bacterial infection is common. We also recommend you keep up to date with these vaccinations.